Thank you for choosing RadCloudUpload. This section defines terms and concepts used in the scope of RadCloudUpload you have to get familiar with prior to continue reading this help. 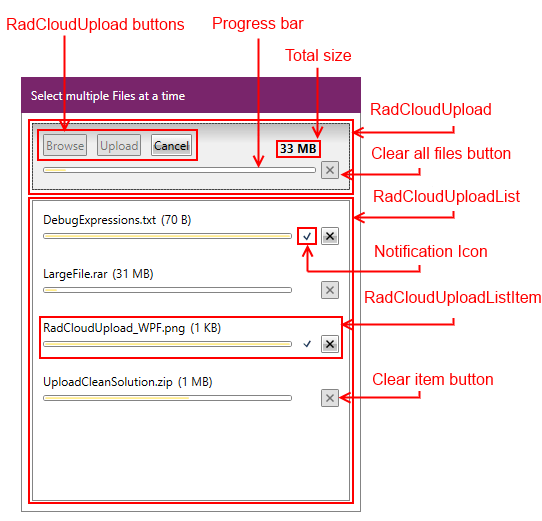 Below you can see a snapshot and explanation of the main visual elements of the RadCloudUpload control. RadCloudUpload - a Control which uses your custom provider to upload files to the cloud storage. RadCloudUploadList - a separate ItemsControl that hosts the RadCloudUploadListItems. RadCloudUploadListItem - a Control that represents a single file and indicates its status. Uploaded - in this state the icon is changed to a tick and it indicates that the file is uploaded. Failed - in this state the icon is changed to an orange triangle and it indicates that the file has failed uploading. Canceling - in this state the icon is changed to an orange triangle and it indicates that the cancelation request has been sent to the cloud provider. Canceled - in this state the icon is changed to an orange triangle and it indicates that the uploading is canceled.